Just thinking about blogging? Here thoughts and suggestions on getting started. Maybe the first thing to setting up a blog is to pick a topic area that you are passionate about. Blogs can be many things. Let’s start by looking at some of the blogs of other folks. 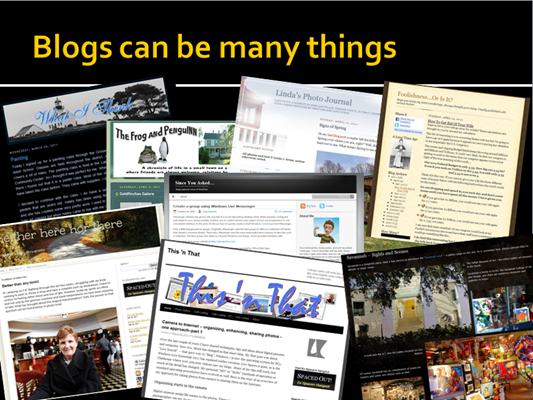 These are some illustrations from a presentation on blogging. Each image is also a link to the particular blog illustrated. The idea here is to show you a small selection of blogs of various kinds. As you look at these, see that the blooger is saying, how she or he is saying it, how the blog is laid out and organized. Certainly this is not an exhaustive collection of topics. You saw a satire blog, a personal, daily chronicle, a photo journal, some personal opinion – the classic soap box, a diary, a couple of technical blogs with how-tos and tips and tricks, and lastly a photo gallery – almost no text, just pictures to enjoy. Has that stimulated your thinking? Are you closing in on your place in the sun, or should I say, cloud?